Welcome to Magic Filters. Launched in 2005, our filters are designed specifically for digital cameras and have revolutionized how available light photos are taken underwater. Simply, Magic filters allow you to produce colourful photos or videos without having to use strobes, flash or lights. for compact cameras in blue water. 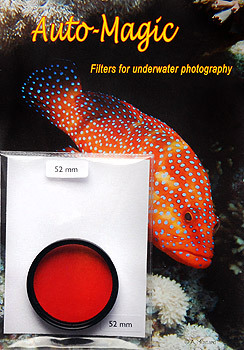 All our filters are complex colour recipes, designed by taking real underwater photos with digital cameras. They are not single colour filters and are not available from anyone else. Please click on an image above to learn more about the filter that you are interested in. If you know what you want please go straight to our online store. To find out which filter is right for you click here and to learn how your underwater photos can benefit from a filter click here. NEW Filters for Micro FourThirds Panasonic 8mm in Original and GreenWater. We are currently having a website text compatability problem with some browsers (especially Safari). If the text on the page above is tiny please either view in a different browser or enlarge the text using [CMD +]. Sorry for any inconvenience, hope to have a solution soon.